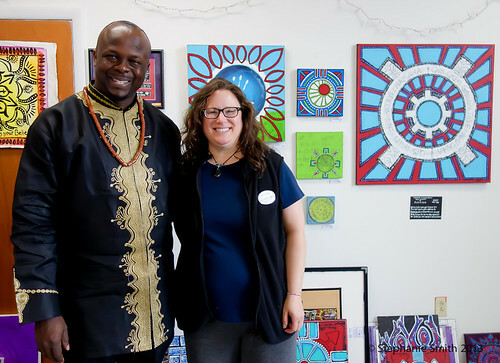 Nigeria's Art Ambassador Ibiyinka Alao﻿ ("Call me Ibi") visited my studio this past Sunday and I was overjoyed at his positive reaction towards my work. He kept looking around at my work with a huge smile and saying, "Yes! Yes!" as if in complete understanding of who I was and what I was doing with my art. I told him that my mandalas were an extension of my drumming- of the rhythms I loved to play, and that's when he told me how his people believed that "art was music frozen in time." Can you believe that? I love it! We spoke about Nigerian (Yoruba) drum rhythms such as Ibo and and of the late great Babatunde Olatunji. I currently have a large canvas on my wall primed with black gesso and he asked about it. I told him that it was awaiting a vision and how I preferred to work on black because of the bold way my colors look over top of it. He told me how Nigerian artists from the Osohgbo tribe often work in a similar manner. Ibi was visiting the Banana Factory to teach a workshop as part of their new heART Series. You can read more about him and view his work here. Lights Out: Reworking an old piece in a new way.